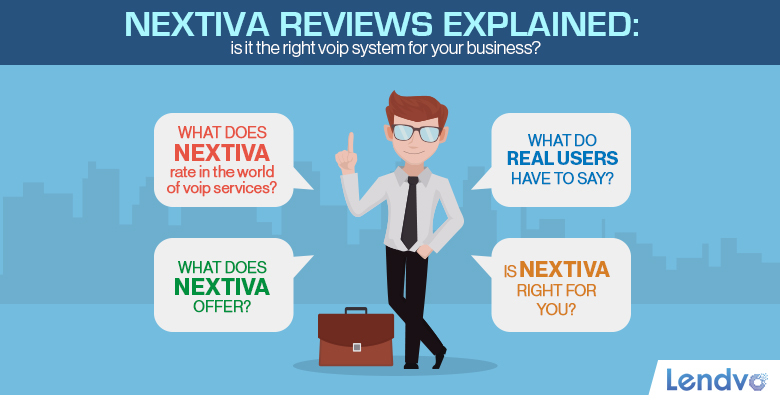 Home/Uncategorized/Nextiva Reviews Explained: Is It the Right VoIP System for Your Business? Voice over IP, or VoIP, is an established technology that’s growing in popularity among businesses that want to build their own customized information networks. While there are many ways to create VoIP implementations in-house, services like Nextiva claim to offer an easy way to get up and running. This provider services some 100,000 companies, so it can be hard to sift through all of the Nextiva reviews you’ll find out there. Fortunately, we’ve massively simplified the decision-making process for you. Is Nextiva really worth your time? Read on to uncover the vital details that differentiate this VoIP service from other alternatives. This business phone service is the main VoIP offering that you might be interested in as an entrepreneur, executive or manager. It lets users access their email, conferencing and mobile presences from a single platform. Engage in three-way calling and supplement your account with additional conference bridges. Nextiva Office also includes a dashboard called NextOS. From here, you can manage users and features or troubleshoot bottlenecks related to individual productivity and service availability. You also gain the ability to oversee incoming and outgoing communications. As many Nextiva reviews point out, the company’s Office packages feature a lot of subtle touches that make them worth looking into. For instance, you can opt for professionally recorded greetings, push-to-talk intercom device operation or hold music. Users can even forward voice messages to email or SMS text via speech recognition. Nextiva Call Center plans are designed to help you manage, track and report on communications more smoothly. These packages essentially let you upgrade to enterprise-level solutions and scale your operations in response to changing demand. Forced call delivery and tagging with disposition codes that inform agents about incoming communication data. Nextiva’s call-center plans come in two varieties: Pro and Enterprise. Neither is associated with setup fees. At $100.00 per month, the Enterprise package costs twice as much as the Pro variety. Both types of call center include basic features like conference bridges, CRM integration and one-click transfers. The Enterprise option, however, sweetens the pot with offerings like flexible disposition and unavailable codes, silent monitoring and priority queue routing. Dashboards that let your agents integrate Outlook contact information and manage call distribution. One other major feature of the Enterprise call-center plan is its Dialed Number Identification Service, also known as DNIS. This service allows you to group different primary and DNIS numbers more logically. If a caller dials one of the DNIS numbers, they’ll still reach the route point associated with the corresponding primary number. You can also use the app to program unique actions, recorded messages and behaviors for specific routes. Individual agents can place outgoing calls from the DNIS numbers and count on incoming responses being delivered to the appropriate departmental route points. Nextiva solutions incorporate advanced analysis capabilities. In addition to trawling historical call data and identifying patterns, you can use the dashboards to predict business outcomes and publish shareable snapshots at will. Users can also create their own custom dashboards and reports for regular distribution. Nextiva analytics tools offer you the power to zoom in on individual users, examine your operations as a whole or organize data according to callers and locations. They also include cool features like letting you format agent data as shareable scorecards or create wallboards for performance gamification. Nextiva Analytics plans can be added to your Nextiva Office plan of choice. For one to five users, you’ll pay $50 per month. Companies with more than five users also pay an additional $5 for each line in their accounts. Private branch exchanges, or PBXes, are switching systems that handle VoIP line intercommunication and routing concentration. SIP, or Session Initiation Protocol, trunking, is a networking standard designed to provide unified VoIP communications services. It also facilitates streaming media processes, like sharing your desktop and video conferencing. Nextiva’s PBX/SIP trunking features let you use your current PBX hardware and convert traditional phone systems to VoIP. They’re also inclusively priced so that you don’t have to pay per-minute or per-trunk call fees. Like many exchange and trunking systems, Nextiva’s offerings are compliant with standard IT authentication and encryption methods, like TLS, SSH and HTTPS. They’re designed for scalability, concurrency and interoperability, so you may find it easier to maintain network transparency and make your own modifications. SIP trunking services are available in metered and unmetered plans. The metered variety starts at $14.95 per month plus $0.008 per minute. The unmetered alternative grants you unlimited calling for $24.95 per month. Both include the same feature sets. Nextiva’s Connect service allows you to respond to incoming calls uniformly whether you’re at your office locations or on the road. It features call routing and forwarding services, and it’s available on a monthly-fee basis. An administration portal and unified cost center. Instant notifications of fax transmissions and receipts. Like many VoIP providers, Nextiva accommodates users who don’t have any equipment as well as those who already possess their own. The firm offers a range of phones, routers, firewalls, fax bridges, session border controllers, expansions and adapters from vendors like Cisco, Polycom and Netgear. It also provides its own branded hardware. Where Does Nextiva Rate in the World of VoIP Services? When reading Nextiva reviews, you’ll likely hear the service being sized up in comparison to other providers, like RingCentral, Ooma Office, ShoreTel Connect CLOUD and Broadvoice Cloud PBX. Here are a few of the key differences. Nextiva has a huge suite of available features. Because these services are split into distinct packages, it’s relatively easy to build a custom solution that suits your business needs. The fact that many of the features, like the Nextiva Office conference branches and dashboards, can be scaled up or customized also gives you ample freedom to tweak your plan in a forward-thinking fashion. Nextiva’s mid-range price point is certainly attractive, but it lacks some of the free trial options that most other services advertise. Fortunately, many of the products that are available with annual contracts can also be purchased month-to-month for a slightly higher fee, so you don’t have to pay a huge amount to try things out. The fact that you don’t pay for setup or have to agree to minimum commitments lowers entry barriers even more. You can also apply for conditional 30-day refunds on a case-by-case basis. Customer support is one of Nextiva’s biggest strengths. Unlike smaller VoIP companies, the firm provides robust service and support options, like professional message recording and troubleshooting. One area where the Nextiva support team really shines is in its onboarding assistance. The company maintains a team of dedicated personnel to help you with setting up your systems and accounts as quickly as possible. Prior users reported being able to reach live help and resolve problems extremely rapidly via phone and email. Nextiva’s massive user community also works to your advantage. The company caters to its patrons by hosting an annual business convention known as Nextcon, where speakers like Apple founders, LinkedIn officers and Nextiva CEOs share ways to promote and grow your business around technologies like VoIP. Because there are so many other diverse users, you’re also less likely to run into problems that haven’t already been solved. As of November 2016, Nextiva provided its services from six data centers in major cities across the U.S., and it had plans to expand to Toronto, Seattle and Miami. The company advertises its data centers as being carrier grade and claims that they provide 99.9999 percent uptime. Such high availability comes in handy for those who rely on their communication networks to perform essential business processes. In terms of security, Nextiva boasts some fairly impressive credentials. In addition to offering PCI-DSS credit card processing certification, the company’s data centers maintain SSAE 16 certification and undergo routine SOC II auditing. Their physical locations are also controlled through multifactor access authentication, biometric security scanning, video surveillance and 24/7 guard presence. These services are obviously designed for ease of use. Nextiva reviews praise the fact that users can work with the company’s software on PCs and Macs or integrate the tools with other CRM and office programs. Apps that seem to function equally well on iOS or Android devices are also a massive selling point. For small businesses with non-traditional HR models, the ability to accommodate distributed workforces promises to ease company growth. What Do Real Users Have to Say? Across the web, Nextiva reviews are generally positive. Some reviewers like the excellent customer support and quality phone hardware. Others laud the user interfaces, flexible pricing and ability to build solutions like multinational CCTV systems. Although a limited number of Nextiva reviews complained about inconsistent call quality or dropped calls, the company’s plans to expand its data center network may soon remedy these deficiencies. The firm also appears committed to improving its services and eliminating outages and technical issues, so those who sign up have a lot to look forward to. Is Nextiva Right for You? Nextiva is a highly configurable solution in terms of feature offerings, pricing and service accommodations. It facilitates international calls and simple setup, and its routing features are fairly advanced. The company’s large size and U.S. domicile also make it extremely easy to get support and ensure call quality. Do you use this company for your business communications? Did other Nextiva reviews cover features that we missed? Share your opinions in the comments below, or visit Lendvo’s massive repository of business articles to learn more about VoIP and other topics.